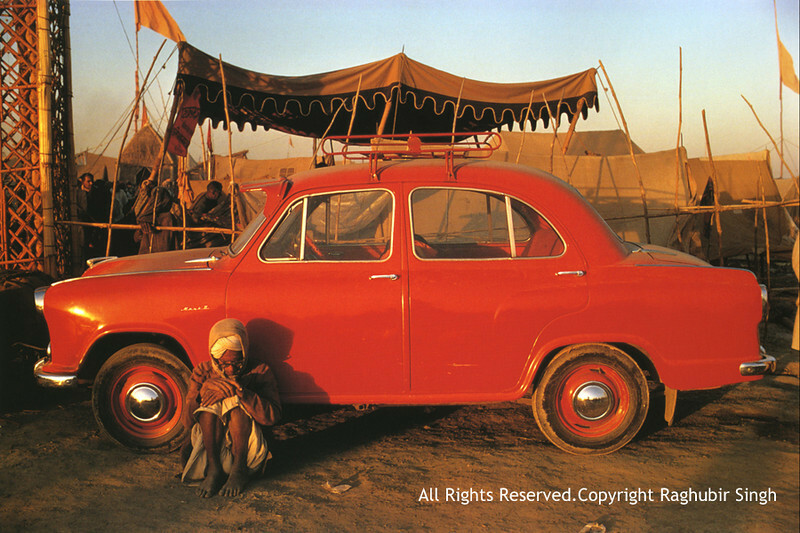 Raghubir Singh was possibly one of the greatest colour photographers of his generation. With single mindedness of purpose, he produced more than twelve books of photographs on India amongst which his work on the Ganga is the best known. He was one of the few photographers to be awarded the Padma Shri. I first met Raghubir Singh in the monsoon of 1987 in Calcutta. I was a 26 year old fledgling photographer with an outrageous idea – to do a photographic book on Sikkim! I had been photographing in Sikkim for about a year, and had returned to Calcutta with a large body of work which I wanted critiqued. I had been a Raghubir Singh fan for some time especially his first book on the Ganga and then Calcutta. Raghubir was in Calcutta photographing for his second book on the city – The Home and the Street. After much difficulty I was able to fix up an appointment at the home of the famous historian, late R P Gupta, who had written the text for Raghubir’s first book on Calcutta. I decide to take my slide projector with around 30 to 40 of my best images. We were introduced by Purnima Dutta, RP’s sister-in- law. Raghubir looked me rather sternly through thick black rimmed glasses as he shook my hand. As I was dumb struck, I busied myself setting up the slide projector and making adjustments to the height and the screen. The slide show lasted for about ten minutes. The rest of the audience asked a lot of questions about Sikkim which I answered but Raghubir remained silent gazing intently at the screen. As my last slide went through, I announced feebly that the show was over and asked for the lights. Rather than look at Raghubir, I occupied myself packing up the projector and the slides while the hostess served tea and “mishti” to all of us. I realized then that Raghubir was not in the habit of speaking much. Finally after about another ten minutes of small talk, I looked at Raghubir and smiled in an asinine way. A frosty glare was the reply and after a moment he suddenly said, “Your photographs are too raw” and slumped into silence once again as though he was pondering on something. A few minutes later he looked at me and said” Come and see me at my hotel next week, I ‘ll talk to you then” and made a quick exit from the room. Thrilled at having been invited by the great photographer himself, I reached the Kenilworth Hotel before the appointed time and paced up and down in the lobby. I few seconds after 7 pm, I rang through to his room and a gruff voice asked me to come up. Raghubir was sitting on one of the beds looking at photographs which were scattered all over. . He nodded at me and without a word continued to look at his images. I stood next to the bed and noticed that he was rejecting photos with great aplomb. Out of almost a hundred prints, he suddenly selected one and placed it next to him. I then noticed he had selected just two or three images. The exercise finished in the next few minutes and then Raghubir waved me to a chair. With great trepidation I sat down wondering whether to say anything or not. “Light is taken for granted” he replied,” If you don’t have good light or you haven’t used the light to your advantage, you have already lost the battle” “As for colour” he said, “I have spent my entire life shooting colour – mainly the colours of India. I never shoot black and white. Colour is important but never just colour on its own. You can’t make a photograph out of just colour”. I ventured to ask Raghubir about his first book on the Ganga which I admired a lot. In particular I asked him about the brilliant opening shot of Swami Shradhanand at dawn at Goumukh, back- lit against the rising sun. For me that was a photograph of a lifetime. In fact I still see that photograph whenever I think of the Ganga. I nodded weakly refusing to believe that it was not a great image. Raghubir was leaving the city the next week. I never met him again. His second book on Calcutta was well received and was followed with work on Bombay, the Grand Trunk Road and most surprisingly the Ambassador car. In April 1999 I was shocked to read in the newspapers that he had suddenly passed away after a massive heart attack in New York. He was only 56. Now almost twenty three years later when I ponder on that one hour I spent with him, I realize that it was probably the most important hour in my journey as a photographer even though neither of us took a photograph.